When I asked for your questions and problems in a recent newsletter, several people emailed asking me about drawing for kids and specifically on how to encourage the reluctant artist. There are two sides to this issue. Some kids just don’t seem that into art, especially drawing and painting. If you have one of these kids, my post on “What to Do When My Child Hates Art” might be helpful. But sometimes, a child does like to draw and paint but gets frustrated with their skill level and/or compares their work to that of a sibling or adult or even to their own vision. And that frustration can lead them to say that they can’t draw and can lead them to avoid drawing. First, please don’t ever let your child hear you say that you can’t draw or that you’re not creative. These kids of ours learn so much from us! Second, try to make drawing fun and lighthearted. 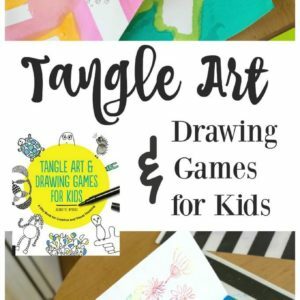 Play art games where the focus is on connection and on drawing for the fun of it. You can also move away from drawing altogether for a while and focus on other process-oriented art activities such as collage, action art, printmaking, suncatchers, clay and playdough modeling, toothpick construction, and photography. Okay, my friends. I hope that helps! If this brings up more questions for you about drawing for kids and encouraging the reluctant artist, please feel free to ask them in the comment section below! I am not that good at drawing (we can say this when the kids aren’t around, right? ), but I feel much better about it when I compare my current art to my previous attempts. Maybe there’s a way to make a game of practicing and seeing improvement. I totally relate to this: “… But sometimes, a child does like to draw and paint but gets frustrated with their skill level and/or compares their work to that of a sibling or adult or even to their own vision. And that frustration can lead them to say that they can’t draw and can lead them to avoid drawing.” My 4.5 year old daughter is more this one than the first one. I’m an artist so I have to be very careful not to get too carried away around her as she gets disheartened when she can’t come up with something as good as mine and throws the paintbrush in the end. Sad but true. She still loves drawing and painting but yes, I do have to be a little careful. It doesn’t stop me encouraging. It had a lot to do with valuing the scribble. Every child has their own creativity, just pull them in their interest, and i like the way child create their own new style in drawing. Thank you so much for this list! My daughter LOVES art, but is extremely reluctant to draw, which is tricky when much of her kindergarten “homework” is drawing. Will be trying some of these tomorrow! CHECK IT OUT! Step By Step Videos How To Draw Anything For Kids. Click here!